Security license plates, technology of the future and high design standards. For over five decades, the name UTSCH has been synonymous with technology leadership and complete system solutions for the production, personalisation, registration and identification of vehicle license plates. This includes basic products such as license plate blanks, hot stamping foils, clapper dies and counter embossing tools, compact and modular embossing presses with a range of performance specifications, low foil consumption hot stamping machines, laminators and laser coding equipment. 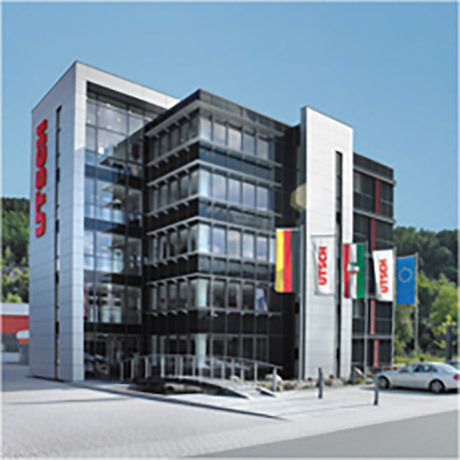 UTSCH also supplies tailor-made computer-controlled and sensor-monitored systems for automatic blank manufacturing in large quantities and fully automated license plate production lines. Using this same equipment, manufactured in house, UTSCH manufactures millions of secure vehicle license plates every year at its plant in Siegen, Germany for customers all over the world. We also supply windshield labels ("3rd license plates") and windshield labels with RFID technology (ulabel), license plate frames, aluminium recycling systems and the consultancy and financial service of Erich UTSCH AG. Every product deemed market-ready by UTSCH is the result of years of expertise, intensive research, numerous production stages and quality controls. For UTSCH this is essential to continue offering made-to-measure system solutions that cover much more than just license plates, because our aim is that UTSCH customers can get everything they need from one experienced supplier.